Made with organic spices and developed at David Rio Chai Bar's Chai Lab on Market Street in San Francisco! This soothing and healthful organic blend combines turmeric with cinnamon, cardamom, ginger, black pepper, and cayenne pepper. Turmeric has been used in India as a spice and is known for its many anti-inflammatory benefits and strong antioxidant properties. This distinctively different taste profile can be consumed on its own, but it also pairs exceptionally well with chai. Vegan, gluten free, non-GMO.�Makes 20 servings. Also available in a 1.5lb bag. 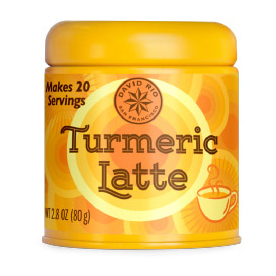 For each 6 ounce serving: Add 1 teaspoon 1 tsp David Rio Turmeric Latte spice blend to a serving cup. Steam 6 ounces of milk, almond or soy; add 2�3 ounces of hot milk to cup and mix well. Top off with remainder of milk to create latte art.